I’mve just launched a challenge to try to encourage people to commit to having 12 microadventures over the next 12 months. I hope you might join in? There are full details of the whole project here. But here is a quick summary of what you need to know. Declare your intention to get involved by sharing this picture on Twitter and Facebook. It’s a key point of commitment! Recruit your mates while you’re at it. Put these dates in your diary [please note that I did this in 2015 so the precise dates may be different if you’re just about to begin], and begin ticking off the list of ideas below it. January: the crunch month. It’s cold and dark. It would be easy to fail before you even begin. So we’re going to keep it very easy this month. Sleep outdoors one night, any time you like. Sleep in your garden (groundsheet, sleeping mat, duvet, pillow). A snowy or frosty night is perfect for this. February: Valentine’s Day. February 14th. Escape the unbearable embarrassment of sitting in a restaurant full of couples mumbling quietly to each other! Climb a hill, watch shooting stars, see the sunrise blaze across the sky. That’s a hell of a lot more romantic! Or, if you are duty bound to do the restaurant thing on February 14th, get out on one of the other nights of that weekend. March: Equinox. March 20th. One of the best things of microadventures is reminding you of the wild universe out there beyond your house, office and commute. Especially if you live in a city. The equinox is the day when the hours of daylight and darkness are exactly equal. There is a spring equinox and an autumn equinox. The days are lengthening now – towards the summer solstice (the longest day), after which they will dwindle towards the winter solstice. These four dates – equinoxes and solstices [solstii??] – are key components of our challenge. 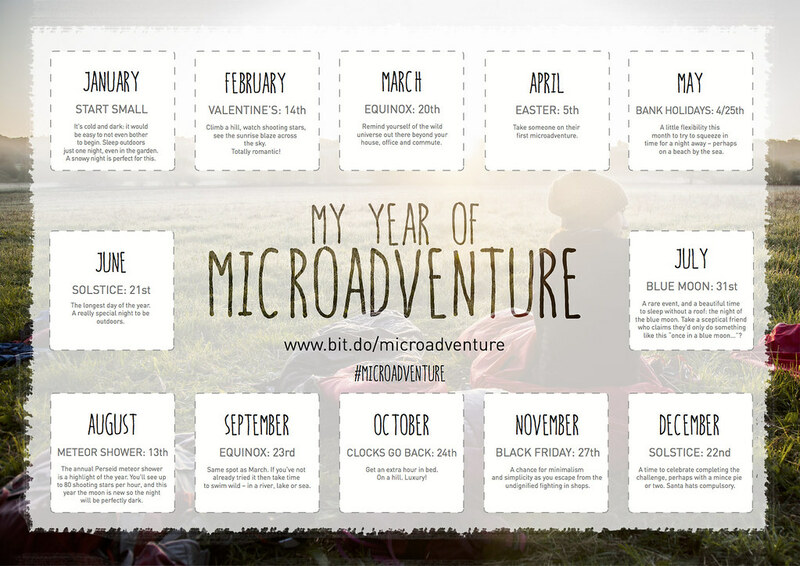 To appreciate the way the world changes and feels over the course of the year, I suggest that you go for your microadventure in the very same spot for each of these dates. See how different it feels in spring, summer, autumn and winter. Do it with the same friends each time; do it with different people each time; do it by yourself – whatever you wish. It also makes the planning and organising of this project much easier when you realise that four out of the 12 outings are to the same spot. May: Bank Holiday weekends. May 2,3,4 or 23,24,25. A little flexibility this month to try to squeeze in time for a night away. June: Solstice. June 21st. The longest day of the year. A really special night to be outdoors. Take an eye mask unless you want to wake up very early with the sunrise! Same location as March. July: Blue Moon. July 31st. A rare event, and a beautiful time to sleep without a roof: the night of the blue moon. Perhaps a chance to take a sceptical friend who claims they’d only do something like this “once in a blue moon…”? Full moons are brilliant microadventure accessories. August: Meteor Shower. August 13th. The annual Perseid meteor shower is a highlight of the year. You’ll see up to 80 shooting stars per hour, and this year the moon is new so the night will be perfectly dark. Perhaps a good night to take kids on their first microadventure? September: Equinox. September 23rd. Same spot as March. October: Clocks go back. October 24th. An extra hour in bed. On a hill. Luxury! November: Black Friday. November 27th. Seeing as Black Friday seems set to become “a thing” in the UK, here is a chance for minimalism and simplicity, to escape from the undignified fighting in shops to buy a bigger telly for £20 cheaper than it will be tomorrow. Don’t forget Bonfire Night (the 5th), too as a great excuse for a microadventure with fireworks. December: Solstice. December 22nd. Same spot as March, June and September. A chance to think how different those four experiences were. And a time to celebrate completing the challenge, perhaps with a mince pie or two. Congratulations! Santa hats compulsory. You can do whatever you like on a microadventure. Share your photos online using the #microadventure hashtag. Over the course of the year you could try to tick things off this list of ideas to try. Those with an asterisk are likely to be deemed most-important if when I sort out some kind of reward system. Thank you for sharing your great ideas! I have always been a micraoadventurer addict without knowing it ! I even use your videos with my students at school ! Is there a Southern Hemisphere version you have done? Afraid not – perhaps you can interpret it for where you live? Yay! I’m really glad you enjoyed it. Thank you! What an awesome year of microadventuring! This has been the best year for adventure and enjoyment outdoors… and all thanks to seeing your post about microadventures. Thanks very much for making me aware of how easy and fun this could be! I’ve just completed doing my 12 micros in 12 months for the DofE diamond challenge (raised nearly Â£400) thanks for idea/inspiration. I did mountaintops to seaside castles that I perhaps shouldn’t have been in but nobody notices when you leave at 06:30. I’ll be carrying on but might take March off this time round as packing up nearly gave me frostbite. Cheers to a new year and new and greater challenges, John.